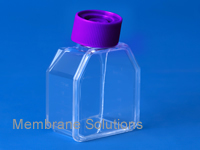 For cell culture, MS offers plug seal and vented cap cell culture flask with growth areas of 25cm2, 75cm2 and 150cm2. 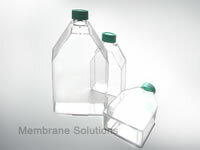 MS® cell culture flasks are with tissue culture-treated surface or non-treated. All the flasks are with canted necks which allow easier pouring and improved access to the flask for pipetting or scraping. Plug seal caps are designed for use in closed systems, providing a liquid-and gas-tight seal. When loosened, this cap can also be used in open systems. Vent caps contain a 0.22 μm pore, hydrophobic PTFE membrane sealed to the cap, offering free and sterile gas exchange consistently while minimize the risk of contamination.